In impoverished villages surrounding Zaheerabad, India, a handful of illiterate Dalit women have taken communication tools into their hands—specifically, video and radio. Their goal: autonomy and self-reliance for their communities. They experience three kinds of discrimination: They are women, poor and of the lowest caste. By using video and radio, they have gained respect in their communities and have contributed to development and cultural identity. 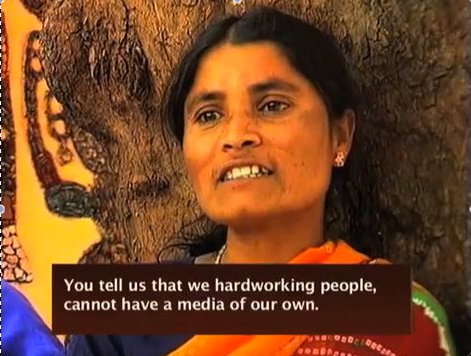 They are “barefoot” reporters and producers of documentary films that contribute to community discussions on cultural issues and traditions that affect the lives of women and all community members in one of India’s poorest areas. Their effort is an initiative of the Deccan Development Society, which works with rural women who are a part of the DDS sanghams, community groups. Most of the women are Dalits. P.V. Sateesh, director of the DDS, says the project seeks to achieve sustainable development, inclusion and participation. “When we started 25 years ago,” Sateesh says, “we were looking for the autonomy to produce crops, autonomy over seeds and autonomy over our natural resources. When later we analysed the impacts of globalisation on the poor, we added … market autonomy and autonomy over media. This was about ten years ago when we started using video and then radio”. Dalit women operate Sangham Radio, one of the first community radio stations authorized in India under a November 2006 Indian law. Although it has not yet broadcast, the station has produced 400 hours of programmes on gender, education, agriculture, health, music, local culture, weeding and cropping. The community radio centre opened in 1996 with a 100-watt transmitter that can reach a 30-km radius and cover up to 100 villages. UNESCO has supported the station as part of its "Women Speak to Women" project. Narsamma appears on the cover of India’s first book on community radio, Other Voices, written by Vinod Pavarala and Kanchan K. Malik. The Communication for Social Change Consortium has produced a video documentary Women of Pastapur. Alfonso Gumucio, who directed the production and did the camera work, followed them through small villages as they shot a new film on the subject of traditional herbal medicine. See below for information on how to order Women of Pastapur. Two filmmakers, Lakshmamma and Pula, talk with Ramullamma, in Shamshadinpur Village, before they begin filming her at work. Many women visit Ramullamma’s home, asking her for advice. Others come to observe her as she works.